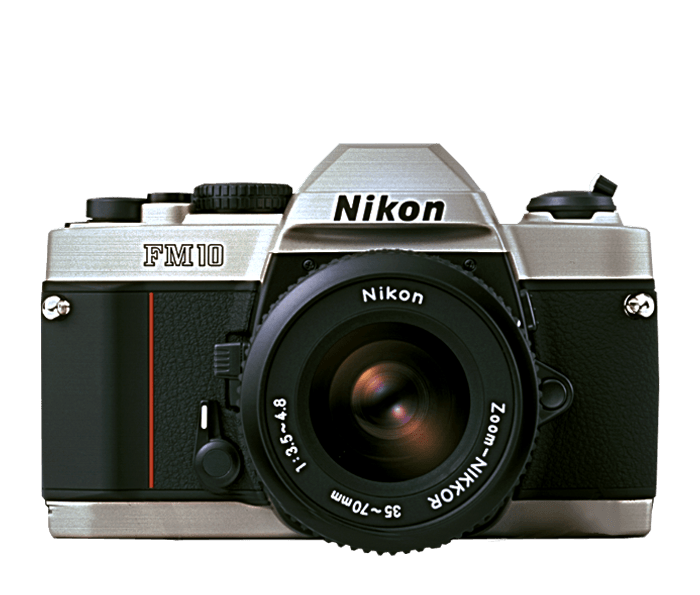 Film SLR: The FM10 is a film-based, manual SLR camera that uses 35mm film. Metering System: Proven, accurate and versatile, this Centre Weighted meter will guide you in taking photos with excellent exposure. With the built-in +, 0 and - LED display, creative adjustments are just a turn-of-a-dial away. Usable Lenses: All Nikkor AF-D, AI-P, AF-I, AI-S and AF-S lenses. Note that AF-S NIKKOR lenses can be used with the FM10 however NIKKOR G lenses, which do not have an aperture ring can only be used at the lens' minimum aperture and can not be opened up. The camera is a manual camera so autofocus lenses will not autofocus but will need to be manually focused using the focus ring on the lens. Shooting Modes: Manual Exposure control. Flash: Non-TTL method controlled from Speedlight. Type of Camera: Manual focus 35mm SLR (Single Lens Reflex) camera with focal plane shutter. Includes Zoom Nikkor 35-70mm f/3.5-4.8 lens. Lens Mount: All metal Nikon F Mount. Accessory Shoe: Standard ISO-type hot shoe. Self Timer: Mechanical self-timer, approx. 10-sec release delay. Weight (without batteries): Approx. 14.7 oz. Dimensions (WxHxD): 5.5 x 3.4 x 2.in. Optional Accessories for FM10: DK-5 Eyepiece Cover, Eyepiece Adapter, Eyepiece correction lenses - 0 DPTR., +0.5 DPTR., +1.0 DPTR., +2.0 DPTR., +3.0 DPTR., -2.0 DPTR., -3.0 DPTR., -4.0 DPTR., -5.0 DPTR.